What's up, ladies??? I hope you're getting a nice change of season where you are. We are on spring break! Excitement and happiness and sunshine and lots of sugary sweets abound. My brain is squarely in spring and summer dress mode, and the weather has been so accommodating that I couldn't resist taking the plunge with the Colette Patterns' Macaron, which seemed the most "like me" stylistically of all the Colette offerings. My first garment sewing experience involved an indie company pattern, in my desire to support indie designers. The sizing and pattern were questionable and the resulting pants were atrocious. Since then I've been in no hurry to experience other indie patterns. I have read in multiple places that Colette Patterns are drafted for a C-cup bust. You know from photos (and some of you IRL) that this does not describe me. Many ladies who have sewn Colette Patterns are enthusiastic about how they flatter Mad-Men-Joan-Holloway (read: full) figures. I tend to steer clear of styles that emphasize how much less fleshy, curvy, and voluptuous I am than most other grown-up women. Still, this pattern is very versatile and I knew if I could get the fit right, I'd make at least two versions of this dress and wear them often. Let's start with sizing. The pattern envelope shows that a size 0 waist and hip are right in line with my measurements, but the size 0 bust is 1.5-2" above my actual measurements. The finished garment measurement for bust showed 1.5" of ease, but based on my actual bust measurement, this would have been 3-3.5" ease for me. A warning alarm sounded in my head and I zipped off an email to Colette Patterns asking for more information about a recommended small bust adjustment technique for this double-darted bustline, and a couple other questions. Sarai, owner and designer for Colette Patterns, emailed me back promptly with a link to various SBA techniques. She also said that she designs size 8 for someone who is 5'5", which would be approx. 5'3" for a size 0. And that the midriff piece falls between the empire line and the natural waistline. I did my best to align the pattern with my sloper, and aside from the bust point on the pattern being a tad high, it looked like the fit was going to be good without any adjustments. What in the what? I traced off the bodice front and the yoke front, and pinned them on Clementine. Again, I was surprised at how good the fit looked! I decided not to use contrasting fabric for the midriff so that it would not be too obviously bad if that midriff piece was not in the most flattering place on my body. The booklet is very well illustrated, and I was skeptical about how the front bodice and yoke are attached. 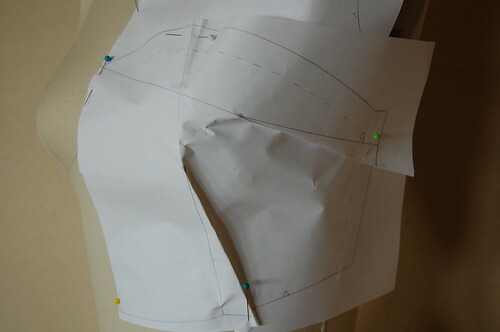 Instead of placing the two pieces with right sides together --> clipping the curved seam to ease in like you would a princess seam --> pressing, you press the seam allowance on the bodice and draw the seam line on the yoke (fabric marker or tailor's chalk), match them, and sew them together. 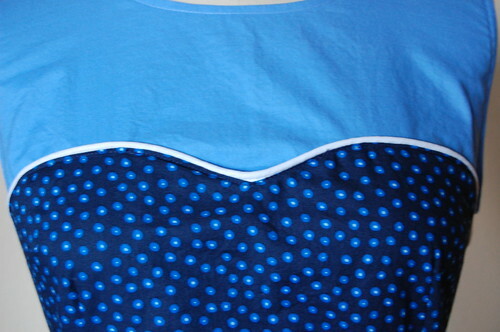 I was not confident that I could press the sweetheart neckline to match on each side -- so much room for error! -- so I trimmed the front bodice seam allowance to 3/8" and sewed on some remnant white piping from this dress to ensure a neat job. Could have done a better job right in the center of the sweetheart, but oh well. Live and learn. I actually think I can do it the Colette way next time. I put the top on Clementine, where it sat for a few days, and I began to really like how it looked without sleeves. So I bias-faced the armholes and neckline. Take one more inch of length close to the hem. The fit is more snug than most dresses I wear, but I am a total fan of Colette Macaron. I cannot BELIEVE that I was able to sew this pattern pretty much from the envelope and get this kind of fit. I might try pinching out a half inch from center front and back -- a little more fitted and less baggy (though you can see from my lopsided posture that the fabric bags asymmetrically. I need a chiropractor). And, despite what I have read, the style looks fine on my non-Joan-Holloway figure. I wore the dress today and got two compliments before lunch from women who wanted the dress for themselves! Hey that's a lovely dress and the colours look great on you! I normally steer clear of any style that is fitted at the waist, but I'd lust after it if the torso piece was empire-ish. Pretty - it's very flattering on you! I think you should definitely try the Rooibos dress - it's flattering in every version I've seen! That's my first Collette pattern, too! I have yet to make it up but seeing your version is so inspiring! I was definitely intimidated by the yoke instructions, too. I want to make mine with sheer stretch mesh for the top and sleeves...am I crazy?? I really love the piping, too. Great choice! so cute! the colors look beautiful on you. I love this style on you--it's so flattering. Beautiful job, Antoinette. This is darling on you. 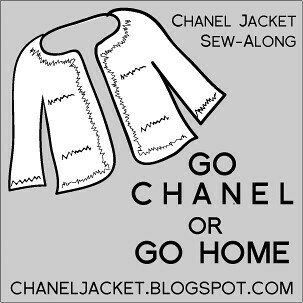 what do you think the best colette pattern is to begin with? I'm all into WENDY right now, but I've got my eye on those beautiful colette dresses for next. I love the pockets on this one you made too. High five! @Violet - On me, the midriff band really feel exactly where Sarai said it would -- below empire but above natural waist. If you look in the Colette gallery you'll see versions of this dress on a variety of figures and this midriff band is pretty flattering on everyone. @stitchywitch - I was just admiring your lovely Rooibos last night on your site! And was going to ask you about just where you overlapped that 1/2" to make your SBA... I will leave you a comment on your blog asking this just in case. @Allison - I think sheer mesh would be very current! If it's poly or nylon mesh, though, I'm not sure how well it would press at the seamline. Hope we get to see your Macaron soon! @Carrie - Thanks, my dear! @ginger - I think if I had a larger bust I might have started with Parfait -- but Rooibos is so beautiful, too. Go Wendy! Her first book was one of my first sewing books and so very helpful. BTW, the pockets are sewn into the pleats. I'd never done that before but the instructions were good and I like the way it all turned out! So cute - so you! Your dress is gorgeous! Love the sky blue and the sweetheart neckline. I also like how you included the story of making it work for your body. I just bought my first Colette Pattern too (Beignet) and am excited to make it, but now you have me considering Macaron as well! aw man, rooibos is totally perfect. One of us should definitely make it, and that pretty much means you, because my sewing skill level just isn't that advanced yet. Anyway, super great job on Macaron! You look awesome lovely as always. Wow! This dress looks really great on you. Great job! super super stylish and the perfect spring accompaniment - so glad that it worked out for you and you get to support an indie company without reservation. I like their suggestion about enjoying the sewing journey, nice piece of karma to get you going! The dress is darling on you. You are kind to trust an indie company after your previous experience and it was worth the risk! That's cute! I haven't tried any of the Collette patterns yet, but I've heard good things about them. you look adorable, as always! It looks totally spring-y and perfect for wearing out and about. It's looks great on you!! Wonderful job! What a fun dress. Perfect for flea marketing in Brooklyn. very sweet neckline... and nice volume in the skirt. great job, as always! Oh, I love it! It's so perfect for spring. 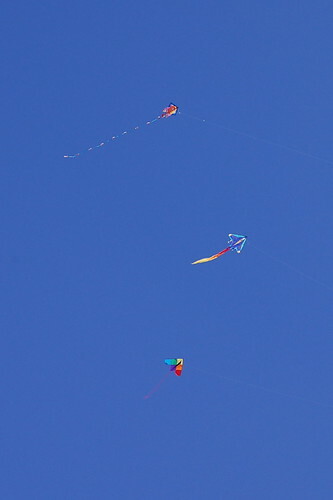 Oh, I'm so bummed we missed the kite festival. I had to teach a class at our church that day. It was the perfect weather! it looks so good on you! well done. I especially like the sleeveless option. Like you, my bust does not have much to brag about but colette patterns seems to be excellent patterns for thinner figures too. I've made both Macaron then Rooibos. Everything about that dress flatters you very well. I like the changes you made to it - not putting a contrasting torso piece in, leaving off the sleeves and adding the piping - more than I like the original. 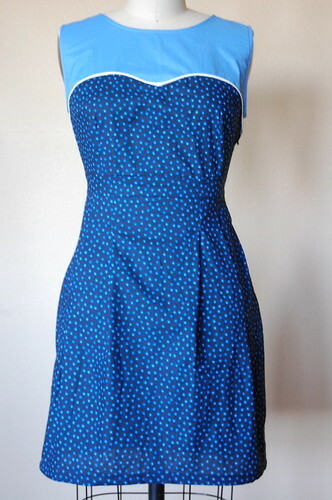 I think I'm starting to love the idea of pockets on dresses, especially as a mom. It's nice to go to the park with just car keys in a pocket rather than a whole purse. no way! when i first saw the dress on clementine i wasn't so sure about it. but seeing you wearing it, i can't get over how cute it is. i am longing to get in my sewing room, but i can't stop lounging....i guess it's just not time yet. you rocked that pattern out!! i'm glad to know we don't have to have joan's figure for these patterns. The piping is a nice touch ... looks great on you! I was also hesitant about this pattern because of the C-cup drafting ... but since I'd have to cut out a larger size than you, I might have to grit my teeth for a SBA. Still on the fence, but your version is making me think that I should nudge myself towards going for it :-). I'm eagerly awaiting the arrival of my first Collette pattern (the beignet). The more I read of her patterns & the more of these great results I see the more I look forward to sewing up one of her patterns! @Faye - Thank you! You're sweet. @Tasia - I would love to see how your Beignet turns out. I have seen some cute versions of it. @Trish - Haha, I will keep you posted on Rooibos. 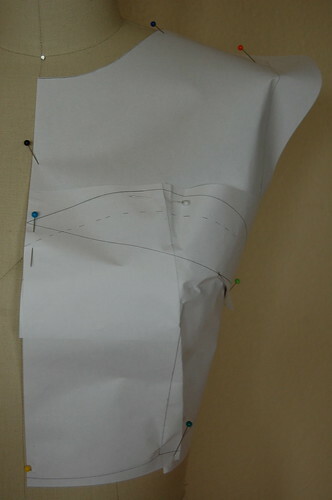 I read in a couple spots that Twinkle Sews patterns aren't too bad for sewing but use A LOT of paper. Really cute clothes in any case! Hope it works out great and we'll get to see the result of your labor. @Adelaide B - Thanks so much. @Mary Nanna - Def. good karma, you're right! @JoanneM - I agree, worth the risk. Colette totally has my support! @Becky - Their size 8 (close to RTW sizing) is drafted for a c-cup, so for the curvier ladies I suppose that is a good thing! I was uncertain about wearing such a retro-style dress but it hasn't felt "not me" at all. @Christy - And we've finally got the spring weather for it. @NGLaLaLa - Thanks. Hope your Colettes make you as happy as this one makes me! @Lindsay T - I was THIS CLOSE to seeing Brooklyn for the first time this week, too. @Steph - You should try this one! @Dana - It is so beautiful. Every year. Hope to see you there next year. :) And sooner if we can coordinate it! @amelie - OMG, I didn't realize till you posted that I am following the My Daruma succession of Colette patterns! I liked both of your dresses. I'm going to go back to your blog and obsess over your Rooibos now. @Sarah - I'm with you on the pockets. There are so many other things to haul around without the purse, too. @heather - Awww, thanks. I hope you've been getting your rest. The sewing will be there when you're ready to get back to it. @Angie - Hope you enjoy your Beignet skirt! Good luck with it. Lovely dress, blue is my favourite colour and it must be one of your best too. I was in the fabric shop the other day and puzzled over the million choices, it occured to me that I should probably visit you for some inspiration. I long to make summer dresses and I don't know where to start! @lopi - Come by for inspiration anytime. I sure get a lot from your blog! I love summer dress sewing, and Burdastyle might be a good place to start your search -- the seamsters there do such a great job of creating new visions from the same basic patterns. @angie.a - What a fortuitous surprise! Like finding a $20 in your coat pocket from last winter. Surprise! It's a Colette pattern! @Jodi - Thanks! Your color! Your beautiful results are making me want to try out a Colette pattern. Thank you for your detailed post - the dress is lovely! Hey Antoinette, thanks for your comments on my Rooibos dress. I've managed to get myself sidetracked with other summer projects in the meantime and haven't done another muslin yet, but I think you're right about starting from the smaller size and doing a bigger FBA. I'd love to see how your SBA adjustments work out when you get around to doing yours!